Okay, okay! Thanks to this week’s Inspiration Workshop! prompt of FAVORITE COLOR, y’all will find that I am a girly, girl. (What? You already knew that?) My favorite color is and has always been…PINK. The brighter the pink, the better. Mike (with an eye roll) will tell you that 70 percent of my nail polishes are some form of pink. The color just reminds me of childhood innocence and cheer. It reminds me of running after the ice cream truck…because the mean driver always made us run…so that I could purchase the ice cream with a pink gumball buried at the bottom of the cup. I also think of my first “real” bike with its pink and gray tassels that my dad surprised me with one summer! Isn’t it amazing that something so simple as a color can bathe in you in emotion? Does your favorite color remind you of a story or person? Come link up with the cool cats! Beautiful pics! 🙂 That nursery is darling! I'm definitely a pink lover, too. That pink damask chair is to die for! I love pink too!! I love the bench and that chair is fabulous! That second photo….ohmy! I LOVE it! Love the pink! My favorite too! The bench is super cute! LOL! I used the exact same line on my own blog post, “The brighter, the better!” Great minds think alike!!! Pink rocks. I love your inspiration photos. Especially the baby room. Precious! love the reference to bubble gum ice cream! that's all I can remember wanting when I was a kid! I have to be honest… I am not a HUGE fan of pink… But, I love several of these pictures! They do pink in the right way, for sure! Girl, I LOVE all of your perfectly pink photos! I just Oooh'd and Ahhh'd over every. single. one! girl that pink damask chair is GORGEOUS! love your inspirations! How sweet is that baby girl room!?!?! It just makes me want another one to rock…of course I'd have to have THAT nursery or it's a no go. The two I have are probably my limit. 🙂 Thanks for stopping by my blog! Wow, you better believe if I wasn't married my house would be decorated in pink and my favorite color turquoise with some yellow splashed around in there. 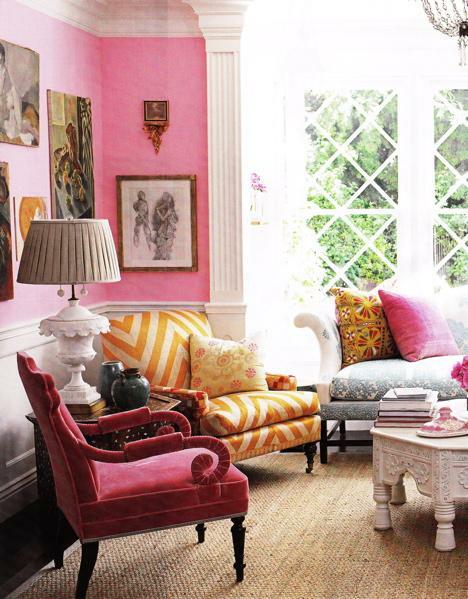 LOVE that pink room with the damask chair!